Norway's $1 trillion sovereign wealth fund is expected to sell some of its oil and gas holdings. The world's largest sovereign wealth fund owns $37bn of shares in oil companies such as BP, Shell and France's Total. But Norway's finance ministry said oil will still be central to Norway's economy. The move is being positioned as a way to diversify the nation's wealth away from oil, not a judgement about the future price of oil. 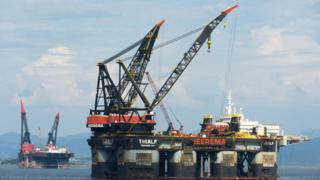 "The oil industry will be an important and major industry in Norway for many years to come," it said in a statement. However, it said: "A permanent reduction in the oil price will have long-term implications for public finances." The government recommendation must still be approved by the country's parliament before going ahead. The advice follows a report from Norway's central bank in 2017 that dropping oil and gas investment would be a good economic move. What to do with an embarrassment of riches? Although it was under some pressure to sell its holdings in the oil and gas sector for environmental reasons, Norway's Central Bank has made it clear that it is selling some of its $37bn of energy shares for more boring reasons, it doesn't like having all its eggs in one basket. This Sovereign Wealth Fund is now worth some $1 trillion with investments and shareholdings around the world. It has been ethical about what it invests in and doesn't buy shares in, tobacco companies for instance.